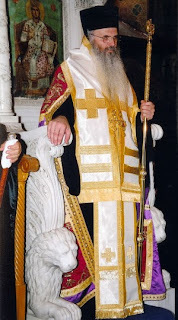 Metropolitan Nicholas (Hatzinikolaou) of Mesogaia and Lavreotiki was born on April 13, 1954 in Thessaloniki. He studied Physics at the University of Thessaloniki where he received his Bachelors in 1976, and after serving in the army he continued his studies at Harvard and M.I.T. where he received his Masters of Arts and Masters in Science, and then in a combined program of Harvard and M.I.T. (HST = Health-Sciences-Technology) he received his Ph.D in Biomedical Engineering in 1986. Their objective was to study the Bio-fluid dynamics of the circulatory system (heart and blood vessels) using Fluid Mechanics and Applied Mathematics. More specifically, he dealt with the invention, the design and study of a noninvasive method of diagnosing valve disease by the acoustic analysis method. Upon completing his studies he worked simultaneously as a research fellow for various hospitals in Boston, including New England Deaconess Hospital in the Department of Anaesthesiology, Massachusetts General Hospital and the Intensive Care Unit at the Children's Hospital of Boston. He also served two years as a consultant in space medical technology for NASA and Arthur D. Little. After teaching two semesters at Harvard and M.I.T. a seminar in "Bioliquids and Hemodynamics", he went on to teach in 1990 at the School of Medicine at the University of Crete as well as at the University of Athens. His preoccupation with the Science and Research of the natural world and man led him on a personal quest towards Orthodox Theology, prompting him to enroll in the study of the primary science of Theology. He went back to Boston where he received both a Masters in Theological Studies and a Masters in Theology from Holy Cross School of Theology, and then a doctorate from the University of Thessaloniki in Bioethics in 2003. The academic study of Theology was not enough to satisfy his great desire for deeper knowledge and to experience theological truth, lead him to the "spiritual university and hospital", Mount Athos, where he stayed for two and a half years. In January 1988 he went to Mount Athos, and from May 1990 to April 2004 he served as a Hieromonk at the Athonite Metochion (of Simonopetra Monastery) of the Ascension in Athens. On 26 April 2004 he was elected the second Metropolitan of Mesogaia and Lavreotiki and enthroned by Archbishop Christodoulos of Athens and All Greece together with 15 Metropolitans on April 30th. Since 1990 he teaches the course "Hemodynamics Pathophysiology of Vascular Diseases" at the Medical School of Crete. Since 1992, he is Director of the Hellenic Center for Biomedical Ethics, and is systematically engaged in Orthodox Bioethics, the sociological implications of biomedicine, the organizations of lectures, seminars and conferences and training young scientists on issues of Bioethics. Conference facilities are located within the Center for Bioethics in the Athonite Metochion of the Ascension in Attica. He is also President of the Bioethics Committee of the Church of Greece and a member of the National Bioethics Committee and a member of the National Transplant Organization. In 2008 (May 20) he received an Honorary Doctoral Degree from the University of Athens School of Theology in Science and Religion. More info can be read here.